Mammals are among the main predators of birds, and it is well known from insular avifaunas that an environment with little or no predation pressure frequently led to the evolution of flightlessness in birds (Feduccia 1999; Steadman 2006). The Paleogene diversification of carnivorous mammals thus certainly had a significant impact on the evolution of birds, especially those with limited or no flight capabilities. Their evolutionary history was summarized by van Valkenburgh (1999) and Rose (2006), on whose surveys the following notes are based. The earliest carnivorous mammals of the Northern Hemisphere were the coyote-sized ungulate mesonychids, which first occur in the mid-Paleocene of North America and Europe. More specialized toward carnivory were the creodonts, which existed throughout the Eocene but had their greatest diversity in the early and middle Eocene. The first true stem carnivorans, the miacoids, probably arose in the mid-Paleocene of North America, from where they dispersed into Europe and Asia; the early representatives of this taxon also were only fox-sized animals. The earliest crown group carnivo-rans, i.e., caniforms, feliforms, and viverrids, occurred in the late Eocene. Caniforms evolved in North America and did not disperse into the Old World before the Neogene, whereas feliforms originated in Asia and appeared in Europe in the early Oligocene, just after the Grande Coupure. After the extinction of dinosaurs in the late Cretaceous, several million years passed before the first specialized mammalian carnivores appeared (van Valkenburgh 1999). The absence of larger terrestrial predators in the early Paleocene may have licensed the evolution of flightlessness in various avian lineages, and it is probably no coincidence that the first occurrences of penguins, phorusrhacids, and gastorni-thids fall into this period. The former two taxa have an origin in the Southern Hemisphere, which correlates with the fact that no placental carnivorans occurred in the Paleocene and Eocene of this part of the earth (see p. 342 in Rose 2006). 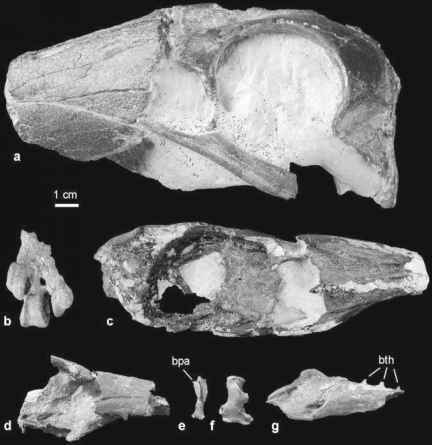 Whereas there already existed larger carnivorous marsupials in the early Paleogene of South America (Sparassodonta), only opossum-sized carnivorous mammals are known from the early Eocene of Antarctica (Goin et al. 1999). These dispersed into the continent from South America, and there may have been a predator-free period in the earliest Paleogene of the Antarctic region, which facilitated the evolution of flightless birds. The origin of flightlessness in early Paleogene birds of the Northern Hemisphere is more poorly understood. Europe was largely isolated from other continents in the late Cretaceous and Paleocene (Smith et al. 1994). While it seems to be a plausible scenario that a species in the evolutionary lineage of the graviportal Gastornithidae lost its flight capability on this continent in the late Cretaceous/ earliest Paleocene, the flightless ratites probably dispersed into Europe from one of the southern continents (Sect. 17.2.1). However, the same factor which may have licensed Sightlessness in the Gastornithidae, i.e., isolation of Europe, would have aggravated dispersal of the flightless ratites. The flightless Gastornithidae and Remiornithidae occur in the Paleocene of Europe, but have not been recorded from deposits of that period in North America. If this is not an artifact of the fossil record, it may indicate a lower predation pressure in the earliest Paleogene of Europe. There was still a high number of flightless birds in the early and middle Eocene of Europe, including the Gastornithidae, Palaeotididae, Ameghinornithidae, and possibly some large species of the Idiornithidae. Of these only the Gastornithidae, which owing to their large size were probably less susceptible to predation, were reported from North America, where their fossil record is restricted to the early Eocene. Northern Hemisphere avifauna was strongly reduced, if not terminated, by the occurrence of larger carnivorans toward the late Eocene/early Oligocene. Owing to the isolation of the southern continents, flightless birds persisted longer in the Southern Hemisphere than in Europe and North America. In the extant (prehuman) avifauna, however, only cursorial ratites, which can outrun predators, coexist with large carnivorous mammals (Rheidae in South America, Struthionidae in Africa), whereas most other flightless birds are (were) restricted to areas free of larger mammalian predators (Australia, New Zealand, Madagascar, and isolated islands). Mammals certainly not only had an impact on the evolution of birds as predators, but also as prey. The main extant avian predators of mammals are strigiform birds and diurnal birds of prey. The former include predominantly nocturnal species and have a significantly older fossil record, which dates back into the Paleocene. If most small mammals of that period were nocturnal, mammalian predation by owls may have preceded that by diurnal birds of prey. Alternatively, owls may have become nocturnal as a result of feeding competition with diurnal birds of prey, whose evolution was probably also intimately connected with that of mammalian prey.